Recipes will follow in separate posts! So . . . that whole thing about getting better about checking in daily with how I’m doing on My Wholesome 30? Yeah. That didn’t work out so well. But it’s not because I’ve fallen off the wagon (though I have made slight alterations to my plan to enable me to stick to it). I’m not going to try to give a run-down of each day, just some highlights. My girlfriends and I enjoy getting together on Saturdays for brunch followed by a matinee at either Hollywood 27 or the Green Hills cinema. Before going to see The Man from U.N.C.L.E. (fantastically fun movie—go see it, because we need it to make enough money for a sequel!!! ), we decided to try a new place called Wholly Chow. I figured it would be more of an organic/healthy type place based on the name, but not so much. Based on my aversion to making special requests when ordering, I went ahead and had a couple of hard-boiled eggs at home before going. That allowed me to be good and order a side of bacon and a side of sausage. (And given their prices, that was definitely a good choice!) And it helps to have a friend who wanted to try their breakfast platter who gave me some of her bacon and sausage as well. That, combined with the eggs eaten before, kept me sated until well after the movie was over. This doesn’t have anything to do with food and everything to do with why I haven’t posted in over a week. I’ve shared before that I suffer from psoriasis, and that my current battle with it is on the palms of my hands and soles of my feet. Well, back in July, even though I was taking weekly Enbrel shots (immunosuppressant—which is why I was sick for much of the first half of this year), it started getting worse and spread up to cover my fingers (mostly palm-side, but now starting to wrap around to the backs). Since I don’t seem my dermatologist again until Sept. 4, due to changing jobs and new insurance not starting until Sept. 1, I made the choice to wean myself off of the Enbrel, since it was obviously doing no good. In the subsequent weeks, my fingers (and toes) have gotten as bad as the palms (soles). The issue with this is that the painful cracks and splits have started forming on my fingertips, sometimes right at the quick of the nail. The worst day was August 16. My hands were so painful that I could barely move without excruciating pain (even just using the remote for the TV was difficult). Thankfully, I had some leftovers that enabled me to stay on plan, though I’m sure I probably didn’t even eat 1,000 calories that day. In the 10 days since then, they’ve fluctuated between almost that bad and not quite so bad. So on the good days, I’m doing some extra cooking so that I have stuff to eat on the bad days. With my psoriasis getting worse rather than better after cutting out all dairy, grains, legumes, and artificial sweeteners, I figured there was no reason to deprive myself of one of my favorite daily intakes—coffee with cream (I’m using heavy whipping cream, because it’s carb-free and because I use less of it than half-and-half because it’s so rich) and Splenda. After over a week with no sweeteners whatsoever, I have been able to cut the amount of Splenda I was using in half. And it’s the only sweetener I’m using. I’ll occasionally have other dairy—a slice of Swiss cheese in a sub sandwich roll-up, blue cheese dressing for dipping veggies or on a salad, or a little whipped cream to go with my fruit for dessert at night. And, yes, I made cream-cheese jalapeno poppers for supper one night. But I’m still drinking either water or unsweetened tea the rest of the day (even though I’ve been tempted to sweeten my tea, I’ve resisted! ), and the only “sweets” I’m eating are a couple of servings of fruit every day. I see my personal trainer on Monday evenings. On 8/17, I had a good workout, adjusted from what he’d originally planned because of the pain in my hands. One of the exercises he had me do were jumping jacks—something I hadn’t done since probably junior high P.E. class. During the second set, my left knee started hurting. (Which is odd, because the right knee is the one I broke in high school and the one I usually have the most trouble with.) The set also included planks (getting up and down off the floor), and two different types of step-ups. So, lots of work on the knees. In a second workout on Wednesday that week, both knees were still bothering me, but I figured it was muscular, since we’d done so much leg work two days earlier. But ever since then, my knees have been swollen and painful. I’m not sure if it’s because of the workouts or because my psoriasis is starting to flare around the joint and is causing swelling (it does this with my ankles occasionally). When I got to the gym this Monday, I explained the issue with my knees this way: it’s like putting a pillow in the hinge of a door and then trying to shut the door. Then, if I try to get down on the floor, which includes going down on at least one knee, it feels like my kneecap is being dislocated, so that’s painful. And because I’ve been walking funny because of it—and sitting a lot more/longer than usual—my lower back was acting up, too. However, I lasted through three sets of squats and rows without pain (other than the good kind). But it was when we tried to go to the second set that I felt like my body was going to fall apart. I did as much as I could, and then finished the workout off with back and leg/knee stretches using a balance ball. Yesterday, I was sore, swollen, and moving around like the Tin Man. But I tried to make myself get up and move around as much as I could just to keep everything lubricated and from freezing up. Today, I still feel some swelling/stiffness in my knees, but because the weather has been so nice, I knew I needed to get out and enjoy it while I could. So instead of trying to go to the gym for a workout, I took a walk, up the alley that runs through the neighborhood up to the I-440 Parkway and back, which turned out to be a hair under three-quarters of a mile. For someone who hasn’t been walking regularly, I averaged 2.5 mph, and there are a couple of hills in that route, too. I have documented a few recipes/meal ideas that I’ll share in separate posts. How are you doing with your eating/challenge? 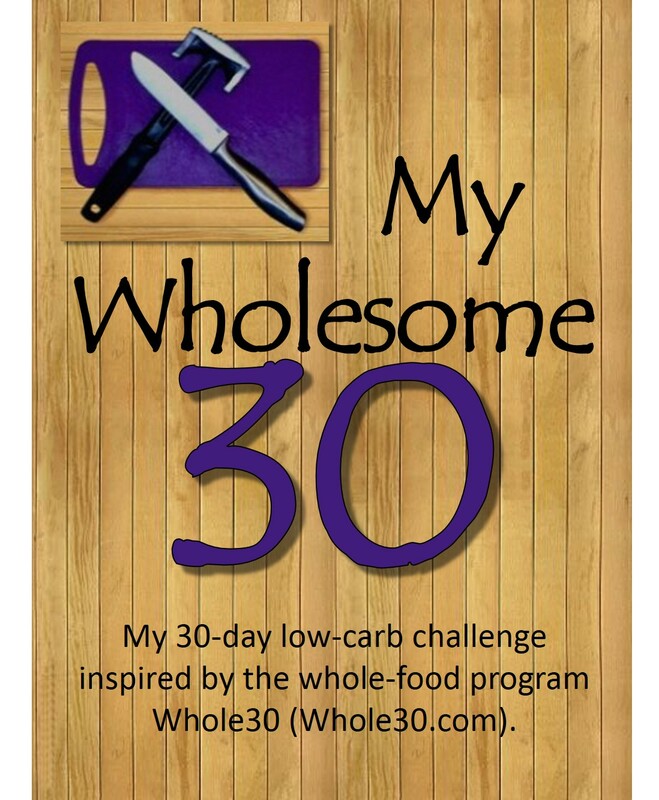 This entry was posted in Activity Report, Food Journal, Journal, Low-Carb, My Wholesome 30, Weight Loss Journal. Bookmark the permalink. The Psoriasis sounds very painful! I sure hope that your upcoming appt presents you with some more effective treatment. Proud of you for still going to the gym and taking a walk! As for me, I finally got back on the treadmill today after a week of not doing it. Hopefully, I can keep doing it more faithfully now.